UVMP in Košice is a one faculty university providing education in bachelor study programmes Cynology, Safety of Food and Feed, Animal Science, and Man-Animal Relationship and its Use in Canistherapy and Hippotherapy, DVM (Doctor of Veterinary Medicine) degree study programmes, which include General Veterinary Medicine and Food Hygiene, and master study programmes in Pharmacy and Market and Food Quality. The mission of UVMP in Košice, as a part of the European Higher Education Area (EHEA) and common European Research Area (ERA), is to develop a harmonious personality, knowledge, wisdom, goodness and creativity in man and to contribute to development of education, science, culture and health for the welfare of the whole society and development of knowledge-based society. UVMP in Košice as a public higher education institution fulfils its mission within the system of higher education institutions in compliance with the Higher Education Act, particularly by providing the highest level professional education in the field of veterinary medicine, food hygiene and environmental protection and, first of all, produces graduates in the regulated profession who hold the degree Doctor of Veterinary Medicine, in accordance with the Directive 2005/36/EC of the European Parliament and of the Council of 7 September, 2005, and the Directive 2013/55/EU. UVMP in Košice is the only institution of its kind providing higher veterinary education in the Slovak Republic. The principal objective of UVMP in Košice is to provide pre-graduate and post-graduate higher veterinary education based on original scientific research in the field of veterinary sciences. Together with other higher education institutions in the Slovak Republic, UVMP in Košice plays an essential role in the concept of knowledge-based society towards meeting the goals of the Lisbon Strategy and the continuation of the Bologna Process. UVMP has received an international evaluation and accreditation. 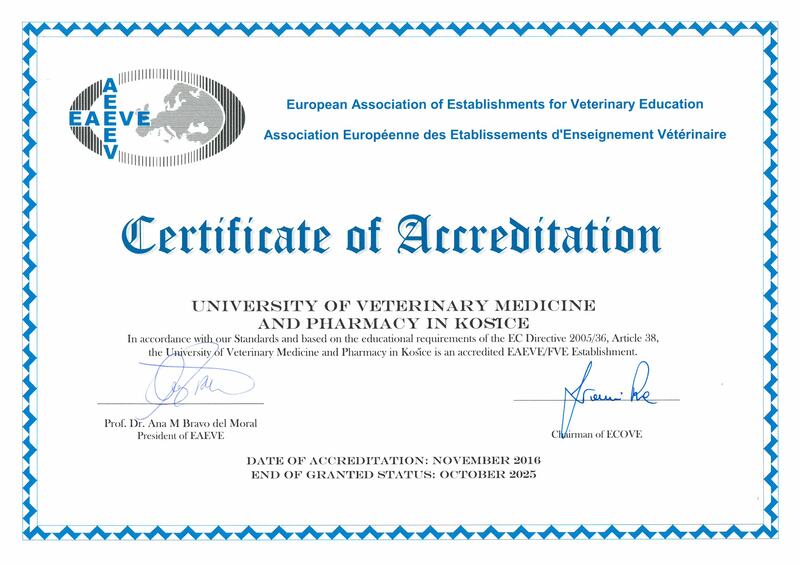 The evaluation process of EAEVE (European Association of Establishments for Veterinary Education) has been successfully completed in 2016. 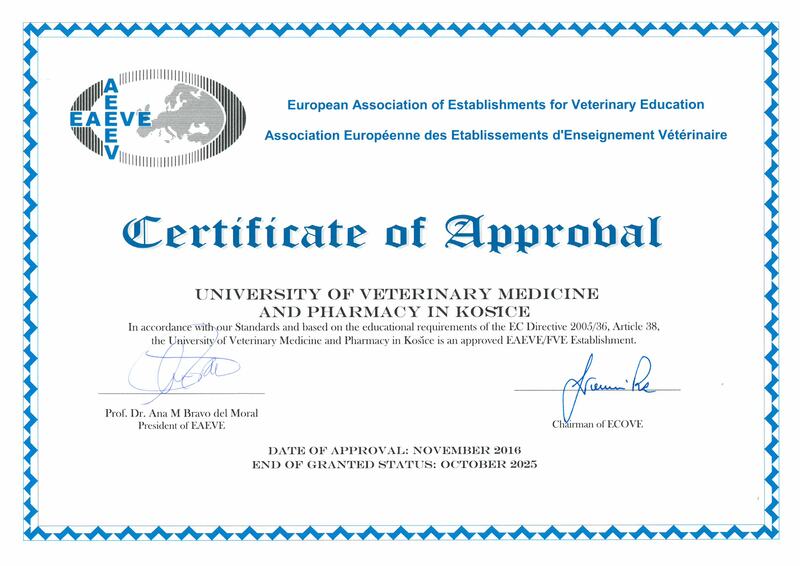 After the visiting experts recommended that our university be ranked among the evaluated and accredited schools, a decision was taken at the ECOVE (European Committee of Veterinary Education) on 23 November 2016. At the time our university has joined one of 11 European schools (out of 96) who have earned the status of an accredited school.